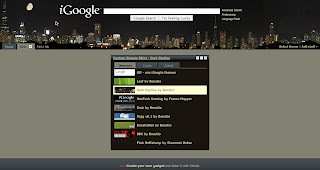 "I noticed your post from here http://hackaddict.blogspot.com/2007/03/quick-tip-skin-your-google-ig.html and wanted to let you know about my new gadget which allows custom skins for iGoogle. See http://bonstio.net/skins. Feedback welcome of course - I hope you like!" And like it I do! I've been wanting to customize my iGoogle skin since the very fist day I used it. I haven't had time to create my own yet, but the included custom ones are pretty neat and the instructions are pretty clear on how to go about doing it. I can't wait to start designing. Thanks Greg!